IRVINE, Calif., Jan. 30, 2017 /PRNewswire/ -- Razer™, the leading global lifestyle brand for gamers, today confirmed that it has acquired the majority of the assets of Nextbit Systems Inc. and has brought onboard the management and employees of the company. Financial details of the transaction, which closed earlier this month, were not disclosed. "Nextbit is one of the most exciting companies in the mobile space," says Razer Co-Founder and CEO Min-Liang Tan. "Razer has a track record of disrupting industries where our technology and ability to design and innovate have allowed us to dominate categories with longstanding incumbents, such as the peripherals and laptop categories. 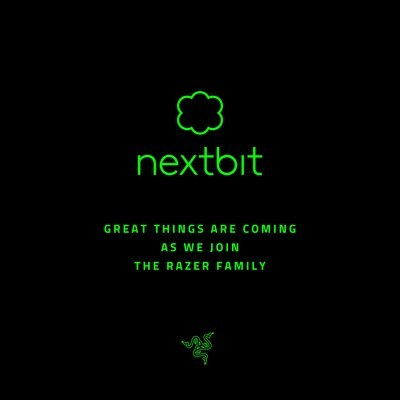 With the talent that Nextbit brings to Razer, we look forward to unleashing more disruption and growing our business in new areas." "In order to reach a wider audience and continue our mission, we decided to join with a larger brand," says Tom Moss, Nextbit Systems Inc. co-founder and CEO. "We're lucky to have found a company in Razer that shares our value of pushing the boundaries of what our devices can do." Razer is transforming the way people play games, engage with other gamers and identify with the gamer lifestyle. Having won the coveted "Best of CES" award consecutively for seven years, the company's leadership in product innovation continues to create new categories for the gaming community that is estimated to have over 1 billion gamers worldwide.